The Ultimate gift for the Ultimate Fighting Championship fan in your life is hitting DVD shelves this Tuesday December 6th, and it comes in the form of a 20 disc DVD set highlighting what was one of if not the greatest 12 month period of action in UFC’s history. This brand new release, not to be confused with the 2009 10 Disc Ultimate 100 Greatest Fights set that hit shelves in conjunction with the promotion for UFC 100 , covers UFC 116 through UFC 131, as well as UFC Fight Night 22 through 24, and UFC Live 2 through 4. It packs all of this in along with a unique set of DVD extras over a whopping 20 disc set, with over 52 hours of UFC action. For the most part, each disc of the set covers a specific event, for example Disc 1 is UFC 116, and Disc 2 is UFC 117. Instead of presenting each event as it aired or as it was released on DVD, the UFC production team swaps in some cool fight buildup videos that includes footage from the fight week building to the event, or exclusive behind the scenes footage before a specific fight takes place. Another interesting addition to this DVD set is the extras included on the 20th DVD which includes features on the best of Joe Rogan 1 on 1, the best of UFC Unguarded and the best of UFC Fight School. The packaging on this set is impressive as since this DVD tells the story of the UFC during this 1 year period of time, what better way to express this than a storybook style package which pulls out of the DVD set outer box and allows you to flip through the pages, each of which contains 2 discs. Some small negatives to mention about this release are the fact that the DVD’s were not put in the package in chronological order, instead they are presented PPV wise, of UFC 116 through 131, followed by the fight nights and Live events, so if the viewer does not realize to watch a certain fight night before a certain PPV they may hear the commentators talking about a fight they havent watched yet. The other negative is that some fights were cut for time to keep this at a 20 disc set. Of the 215 fights presented on the events in question, 170 of them are included in this set. Some of the fights cut were simple prelim fights, while others were a bit more suprising, nonetheless, if your not an absolute completionist, then this is still an absolutely awesome release. Even with a few prelims here and there missing, the set makes up for it with a great slew of bonuses and never before seen behind the scenes footage, 10 plus hours of previously unreleased footage that is, and this makes it an absolute must buy. 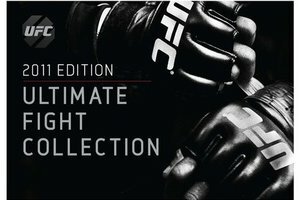 Currently on Amazon.com and Amazon.ca for 99.99$, this set is well worth the cash, and would be much appreciated by any MMA fan on your list! I know I would love to find it under my tree on christmas morning, so if your searching for that perfect gift for the MMA fan in your life, you need not look any further. 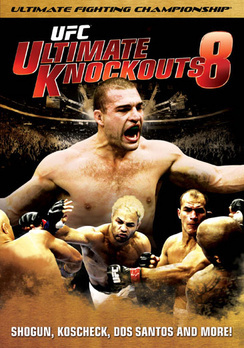 With the holiday shopping season right around the corner, its time to start looking at the latest releases that can appeal to the MMA fan on your list, and the first of such releases is the latest in the UFC Ultimate Knockouts DVD & Blu Ray series, this installment being Volume 9, hitting shelves on November 8th. Much like the other releases in this series, the DVD checks in with a 93 minute run time and features the latest in high profile knockouts from UFC battles that took place over the past year. As the tag line on the DVD`s back cover says, nothing puts an exclamation mark on a fight like a great knockout, especially when your least expecting it. This was the case in Anderson Silva vs Vitor Belfot fight from UFC 126, It was the crane kick to the head heard around the world which would later spawn Lyoto Machida`s similar finish on Randy Couture at UFC 129. To say the least I have always been a big fan of the knockout, and honestly regardless of the type of UFC fan you are who doesnt like a good knockout every once in a while? Extras are slim on this release, limited to only a Total TKO’s featurette. However considering the DVD’s main subject there is little more you can expect out of a 1 disc release such as this one. That being said, UFC producers still try and go all out with another one of their awesomely produced highlights packages. For the big fans of the KO out there, this series continues to provide exactly what your looking for. It may not be content heavy release, but could always be good for a quick afternoon watch with your fellow UFC fans, and for the UFC fan on your holiday shopping list, its an affordable gift that should be much appreciated. This in depth DVD documentary comes in a special book like packaging that includes 12 pages of images from Royce’s career as well as a biography. It is quite impressive to look at and is a much appreciated added touch to what is a well produced 2 Disc DVD documentary. Disc 1 begins with the 90 minute documentary which aired on Spike TV focusing on the evolution of the Gracie Jiu Jitsu discipline from its roots in Brazil to its expansion to the US, and ultimate explosion thanks to the success of Royce Gracie at the first ever UFC event in the early 90’s. What begins with a spotlight on Gracie jiu jitsu quickly becomes the history of the UFC as we hear the story of how UFC 1 came about and the stories behind the battles of UFC 1 through 5 and while this is the Ultimate Royce Gracie, it could easily be entitled, The History of the UFC Part 1. Participants in the documentary include Royce himself, UFC announcer Joe Rogan, and numerous participants from UFC 1 through 5 such as Dan Severn, Art Jimmerson, and Jason De Lucia. A wide array of bonus features is offered up on the 2 disc set. First up is every Royce Gracie fight from UFC 1 through 5 in their entirety. While on Disc 2 we get the UFC Hall of Fame induction ceremony for Gracie as well as his 3 fights in full from the Pride events in 2000 & 2003. The bonus features conclude with Gracie’s last fight in the UFC which took place at UFC 60 against Matt Hughes. In closing, the UFC did Royce Gracie right with this DVD package. I highly recommend picking this one up for your collection, not only is it very well produced, but its highly informative and comes in one of the coolest DVD packaging ive seen to date for any MMA DVD. If you’ve seen the Spike special, you know more or less of what to expect, for those who didn’t you wont be disappointed. 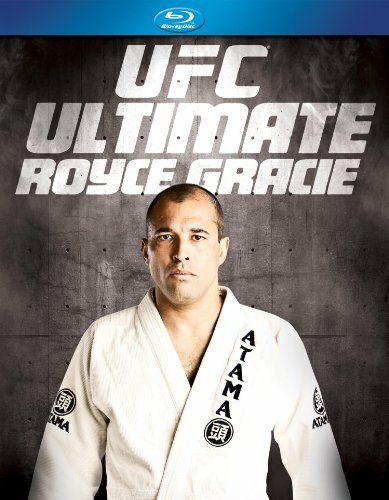 UFC’s Ultimate Royce Gracie will be available on DVD and Blu Ray on May 10th from Anchor Bay Entertainment with a SRP of $24.98 for the DVD and $34.99 for the Blu Ray. For more info check out ufcstore.com or your local UFC DVD Retailer. When looking at the main card of UFC 123, you could say that this was an event that featured both the fast rising prospects of the UFC, as well as the established big names who were looking to get their careers back on the world title track. 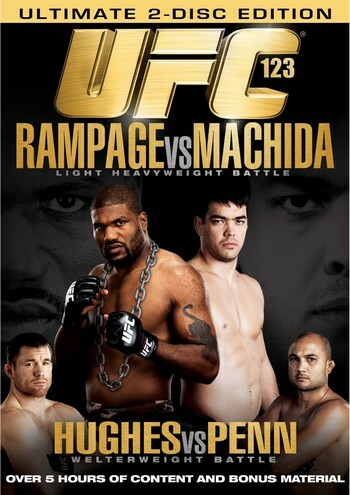 Headlined by a pair of former light heavyweight champions in Quinten “Rampage” Jackson and Lyoto “The Dragon” Machida as well as the third and final chapter of the BJ Penn/Matt Hughes trilogy, UFC had the potential for yet another strong event in what was a very successful year of 2010 for the UFC. The opening matchup of the night Australian George Sotiropoulous up against Joe Lauzon. Sotiropoulos survived an early onslaught from Lauzon to eventually take the fight to the ground and prove why he is one of the better grapplers in the UFC as he would eventually grapple his way to a submission victory over Lauzon in the second round via Kimura. In the second bout of the main event card, the undefeated “Mr Wonderful” Phil Davis submitted Tim Boetsch with a never before seen one arm kimura in the second round. Davis moved to 8-0 with the win and could be a major player in the years to come in the light heavyweight division. The third fight featured the debut of Maiquel Falco against Gerald Hurricane Harris. The story of this fight was Falco showing the UFC fans that he has what it takes to hang in the octagon as he beat down Harris for the first two rounds and then went into cruise control through the third round to earn an easy victory. I may not of liked the fact that the third round was boring as hell, but I understand the strategy of ensuring your victory without risk. The co main event of the evening featuring BJ Penn and Matt Hughes did not last long. This was the rubber match between the two men, and was an extremely important fight for BJ Penn as he came off of back to back losses to Frankie Edgar, the second of which he was dominated for 5 straight rounds. This fight however was Penn’s rebound, as easily walked away with the bragging rights finishing Matt Huges 21 seconds into the fight. You could see before the fight even started that Penn meant business as he intensely marched to the cage and came out swinging and swinging hard for that matter as Hughes had no idea what knocked him out, admitting after the match that it was so hard that he thought it was a kick or knee that caught him. The main event between Rampage and Machida was a fight that went the distance and delievered a somewhat interesting decision. The first two rounds of the fight were nearly identical as both men felt eachother out. Machida proved why he is one of the most elusive fighters out there as he stuck to his circling away and picking his shots while Rampage stalked Machida endlessly. The first two rounds were hard to score but an edge could be given to Rampage. Realizing this Machida entered the third round with some urgency and it paid off as he rocked Rampage with a flurry of shots and nearly finished the former PRIDE star. Rampage survived and the judges delivered a split decision of 29-28 in favour of Rampage Jackson, who in defeat admitted that Machida beat him up real bad in the third and deserved the win, and even went as far as to offer him an immediate rematch. It was a entertaining main event and personally I think the right man got the win. As Is the case with every major UFC DVD release, this is a 2 disc set featuring hours of bonus materials. The entire unaired undercard is on the second disc along with the usual bonus feature suspects such as the Countdown to UFC 123 special, the Weigh in show and UFC.com promos. Also featured in the bonus materials is the 30 minute behind the scenes featurette contains a look at the team of coaches behind a fighter and how they help the fighters they work for. Kenny Florian’s perspective for the BJ Penn/Matt Hughes match and Ryan Bader’s perspective for the Rampage/Machida main event. The featurette wraps up with a look at the different fighting styles of the UFC fighters. I highly enjoyed UFC 123 on DVD, it may not of been one of those stacked cards, but it was a good night of fights and as always a DVD chock full of quality bonuses. The main event is good fodder for a debate with your friends on the scoring and whether or not you’d like to see a rematch one day, and overall should make a nice addition to your UFC DVD collection. The Ultimate Fighting Championship is back again with what can be seen as one of their biggest events yet: UFC 121 LESNAR vs VELASQUEZ. This event was held on October 23rd, 2010 at the Honda Center in Anaheim, California. The UFC set out to shake the world and they indeed just that as in the main event of the evening Cain Valesquezdefeated Brock Lesnar to become the new UFC World Heavyweight Champion. The fans in attendance certainly got their money’s worth and now you can too, in the comfort of your living rooms. The card is stacked from top to bottom and like always, this DVD is incredibly well produced and put together. We start the night off with Brendan “The Hybrid” Schaubvs Gabriel Gonzaga in a Heavyweight bout. These too men take some time to feel each other out in the 1st round, but Schaub finishes strong as he swarmed Gonzaga with solid punches. Round 2, begins in the favor of Schaub again as he capitalizes on Gonzaga’s mistakes. This continues into the 3rd round and Schaud take the fight via judges’ decision. Next up is a Light Heavyweight fight “teacher vs student” featuring “The Huntington Beach Bad Boy” Tito Ortiz vs “The Hammer” Matt Hamill. Tito opens strong, with many strikes until Hamill takes him down. The spend most of the round standing and boxing hard. Hamill takes the fight to the ground in the 2nd round, where he dominated. Hamill takes this on after going the distance via judges’ decision. The 3rd fight of the night is Diego Sanchez vs Paulo Thiago in the Welterweight division. These two men hit hard and go the distance (for the third time tonight) and Sanchez takes this fight via Judges’ decision, as he dominated Thiago to finish this fight. We continue the night again in the Welterweight division as Jake Shields took on Martin “The Hitman” Kampmann. These men go the distance, making this a lengthy evening for the UFC as Shields picks up the win by judges’ decision. Finally, we get to the bout that everyone has been waiting for: Brock Lesnarvs Cain Velasquez for the UFC Heavyweight Championship. What a shocker this is as Lesnar gets shook hard and never recovers. Velasquez is your new UFC Heavyweight Champion as he wins via TKO in the 1st round. The bonus features of this 2-disc DVD set include the preliminary fights from the evening, Countdown to UFC 121, The Weigh-In Show, and the usual behind the scenes and other promos. The crowd in Anaheim is vocal the whole way through, and really gives this event an epic feel. So whether you’re just a casual follower or a die-hard, this is a must own. Your night will be action pack and filled with many different examples of why the UFC is the leader in MMA. This release only features one disc. However it features over 80 minutes of insane knockouts from all the best in the UFC. This DVD starts off strong with what was probably one of the more surprising knockouts in the history of the UFC in the fight between UFC knockout legend “The Iceman” Chuck Liddell and Shogun Rua in Montreal at UFC 97. It goes on to feature names like Drew McFedries, Lyoto Machida, Anderson Silva, Forrest Griffin, Frank Mir, Frank Trigg, Shane Carwin and Brock Lesnar. The Bonus features are somewhat light but acceptable for a small highlight release like this one. It features Promos for other releases from the UFC and “Total TKO’s.” This is where the production shines. “Total TKO’s” is a six minute highlight reel of some of the best TKO’s in the history of the UFC, nicely spliced together with quick match highlights and tough music to blend it together. For the casual fan it’s a great way to spend an evening reliving some of the UFC’s best knockout finishes! For 20$, this is a must to any MMA DVD/Bluray collector. It continues the hard-hitting action from itspredecessors. 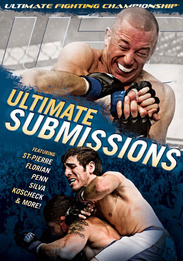 This is a 1 disc release that features 30 matchups from the UFC’s video library that ended in a submission victory. With a run time of 70+ minutes only the preview and highlights of each fight is shown, but still gives you a feel for the numerous different submission possibilities an MMA fight can end with. The 30 featured bouts include the likes of Georges St Pierre vs Matt Hughes, a trio of Frank Mir fights vs Tim Slyvia, Brock Lesnar and Chieck Kongo, Demian Maia vs Chael Sonnen, BJ Penn vs Kenny Florian amongst many others. The strength of this DVD release is truly in the bonus material, which in a way is backwards as you’d think the main feature would be the release’s main attraction, but if there is one reason to buy this DVD its for the bonus matchups which feature 20 full length fights broken down into 2 sections. The first being “Submissions From The Vaults” including early day UFC gems such as Ken Shamrock vs Royce Gracie 1, Scott Morris vs Sean Dougherty, Royce Gracie vs Jason De Lucera, Dan Severn vs Anthony Macias, Oleg Taktarovus vs Ernie Vedizia, Marco Ruas vs Larry Cureton, Tank Abbott vs Steve Jennum, Mark Coleman vs Dan Severn, Randy Couture vs Tony Halme, and Kazushi Sakruaba vs Marcus Silveira. The bonus materials wrap up with a short featurette on fighters who refuse to submit. Overall the bonus materials run nearly 90 minutes. With the holiday season quickly approaching, this could be a easy gift idea for the MMA fan in your life. Holiday shopping aside, for 20$ this is easily a good addition to your collection. You are currently browsing the archives for the UFC category.